Cold and flu season is upon us and immunization clinics are opening across Canada. You hear coughing behind you in the grocery line, sneezes on the subway and sniffles at work. You can't avoid everyone for the duration of the winter, so how do you protect yourself? While you can't always maintain a five-foot distance from the subway sneezer during rush hour, you can do your best to prevent catching a cold or the flu by integrating these manageable lifestyle tips into your daily routine. I do my best to incorporate all of them, but even incorporating a few can make a big difference in boosting your defenses this winter. Exercise and healthy eating are great for your health and general well-being, but performing vigorous exercise means your immune system takes a dive 30 minutes post-workout. To prevent sickness wile your immune system is temporarily compromised, make sure to wash your hands following your workout -- especially if you're at a public gym. I prefer classic soap and water, but if you can't find soap, hand sanitizer is a good option. A hot beverage during the winter months can do a lot to soothe a sore throat and perk up your mood. While a hot chocolate every night may not be ideal from a diet aspect, a big mug of tea and a roaring fireplace is the perfect balance. If you're looking for a flavourful drink that also packs an extra immunity boost, the A. Vogel Echinaforce Extra Strength Hot Drink has antiviral, antibacterial and anti-inflammatory properties, which act as a preventative measure and treatment for colds and the flu. You've heard it from your doctor, your mother, and anyone who's had the flu: get the flu shot. Skip the aches, the fever, the chills and the general all-over poor feeling by getting immunized and encourage your friends and family to do the same. You can even enhance the flu shot by pairing it with COLD-FX, as evidence shows this extract from the root of North American ginseng helps increase its effectiveness. Probiotics are hot because of their ability to support immune function. We typically know their positive actions on our gut, but BLIS K12 is a specific strain of Streptococcus salivarius, a bacteria found naturally in the mouth of healthy individuals. It has been studied for more than 30 years for safety and efficacy. It promotes oral health by helping to reduce the incidence of Streptococcal pharyngitis or tonsillitis and has been shown to significantly reduce the common throat infection. Sleep is imperative to a healthy immune system, and it's not just about the hours you clock on the pillow; it's essential to have uninterrupted, quality sleep. If you are coming down with a cold and are feeling congested, you are going to have trouble breathing, which will lead to waking up several times at night. This will impact the quality of your shut-eye. When I start feeling congested, Breathe Right Nasal Strips are my favourite drug-free option for relieving nasal congestion and allowing me to get that impactful, deep sleep. Lastly, follow the hands-off approach. Hands off your face, that is. Germs are everywhere and sometimes you can't avoid them, but you can avoid touching your face, eyes and nose. By avoiding these areas you reduce your chances of catching and spreading the germs. Sometimes we touch our face without even realizing, so the best preventative step, and I'll say it again, is to wash your hands regularly. Also, avoid shaking hands with others during this season (or be sure to sanitize right after if you absolutely must). 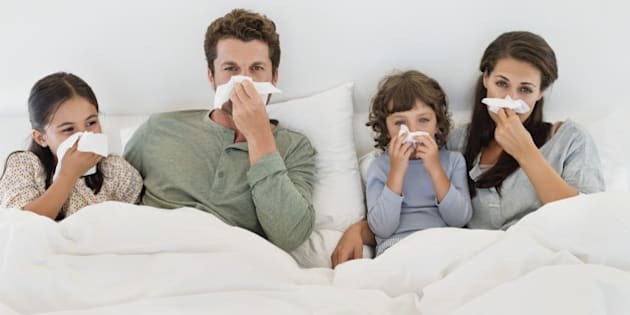 By adopting these manageable lifestyle changes and encouraging your friends and family to do the same, you can help prevent the spread of germs and keep your immune system boosted during this year's cold and flu season.